I visited the library this evening and came home with fewer books than I returned. That never happens! And it should never happen again! 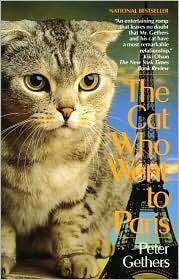 I finished reading the most delightful little book – The Cat Who Went to Paris. The author is given Norman, a Scottish Fold kitten. The pictures are adorable, the stories are hilarious, and the book is a very quick read. Thankfully, our library carries at least one more book in this true life series about an adorable and very intelligent cat! Today was mostly about cleaning and budgets. I puttered around the house most of the day, picking up after our weekend. The day was not exciting but I was content in my activities. The only things I have left on my agenda today are half an hour of research and then Bible study. Day 14 of the cleaning challenge is all about time management. For a few days, I’ve been paying attention to how I spend my time. While I rarely leave the house during the week, my days aren’t all alike. I spend some days doing a lot of contract work, up to 5 hours each day. Other days are spent cleaning and organizing. And a few days here and there are spent mostly reading once my daily housework is complete. I have read a lot of books in the past month. Last week, I spent way too much time watching television. We don’t own a television but there are a multitude of (legal) shows and movies available online. When I realized how much time I was wasting watching television, I was disgusted with myself. I was watching up to the equivalent of a movie a day. While I was still being productive, completing all of my housework and devoting hours to my contract job, I felt my time could be better utilized. I made myself a promise – I will spend more time with my Bible every day than I will with television or movies. It’s sad to realize that I was spending more time watching television than reading God’s word. Over the last three days, I have kept my promise. Each day, I have spent more time reading the Bible than watching television. The Cat Who Walked a Thousand Miles is a great little story of adventure, perseverance, and curiosity. And it’s told from the perspective of a cat! What could be better? Praise the Lord! Today was a very good day for our car. We visited Jiffy Lube and had an oil change done (expensive, even with a coupon!). Then we had our emissions tested so that we could renew our car registration. The car passed! I’ve been reading a lot lately. Today I finished the book Unveiled, the story of Tamar, by Francine Rivers. It was a quick read but very good. Tamar’s story is a short one, covered in Genesis 38. Only one chapter is written about her, but the story covers years in time. I had always wondered why Tamar chose to disguise herself as a prostitute, of all things. The book gave me understanding of one possible reason she made that choice. I found the book at the library. If you have a chance to read it, check it out. It’s a great insight into a strong woman who is included in Christ’s lineage.